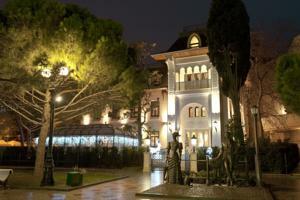 Once a Black Sea playground for Russian Tsars, Yalta has turned into a summer haven for Russian and European travelers. Yalta has no airport, so some combination of planes, trains, buses and taxis will be needed to get you there. Flying into Kiev is a must. From there, most travelers then fly to Simferopol (the capital of the Crimean peninsula). And finally, from Simferopol they take either a bus or a taxi down to Yalta. As always, my preferred option is to rent an apartment instead of a hotel in Yalta. You simply get much more bang for your buck. (Or for your grivna, I should say.) That being said, if money is absolutely no object (i.e., you don’t mind paying $500/night for your room), then by all means, check out Yalta’s 5 star properties like the Villa Elena or Villa Sofia. As with the restaurants and cafes on Kiev’s main drag called Kreshatik Street, I’ve never been impressed by the food along Yalta’s boardwalk. It’s a sad truth that the best food there seems to be the McD’s at either end of the strip. As with so many touristy cities, the best food is usually a bit removed from the high traffic areas. My favorite restaurant in Yalta is ПИНТА (Pinta). It’s a fun pub, often with music, and good food at reasonable prices. (For example, ten bucks for the grilled salmon is a good deal.) I’ve heard great things about The Grand terrace (also at the above-mentioned Villa Elana) but I’ve ever been there. 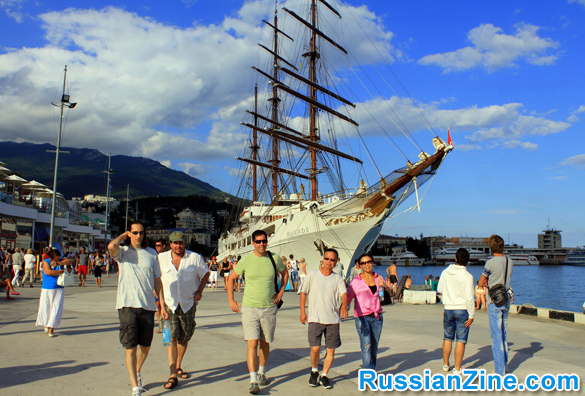 Yalta’s local transportation is the same as most Russian and Ukrainian cities. The very cheapest route are the trolleybuses. The next level are the minivans and buses (collectively called marshrutki) for twice the price of the trolleys. (We’re still talking pennies per ride in either case.) And then, of course, taxis. And the standard caveat applies in Yalta as elsewhere: Only use taxis with meters. And if you speak no Russian, ask a hotel employee to hail one for you. 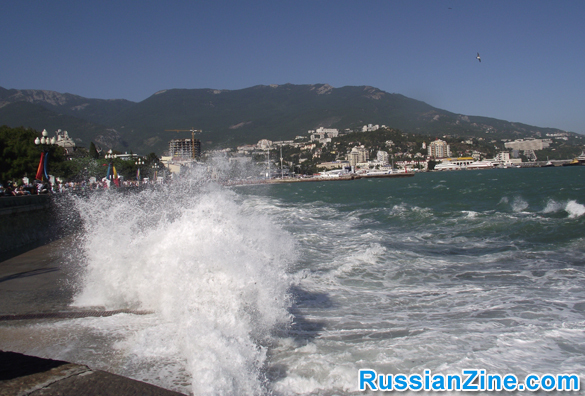 Boardwalk: Constantly crowded in the summer, Yalta’s boardwalk is the heart of their tourist center. Livadia Palace: Livadia Palace is up in the mountains, looming over Yalta like…..well, like a Tsar’s palace, which is what it was. 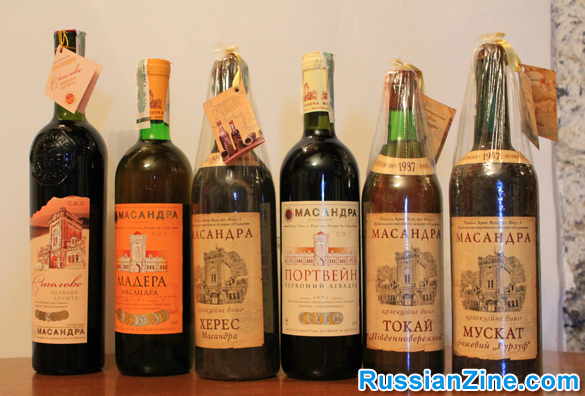 Massandra Winery: Along with amazing scenery and history, Crimea is also known for its wines. 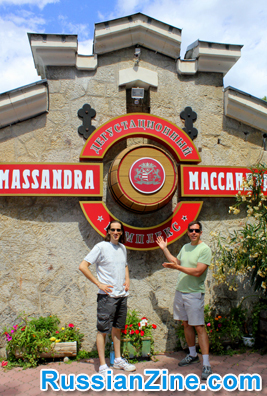 Thus, in Yalta, a fun side-trip is taking a tour (and a wine tasting) at the Massandra Winery. The regional specialty seems to be sweet wines, which I’m personally not a huge fan of, but the tour is still great fun and worth a few hours. But please be responsible and take a cab. 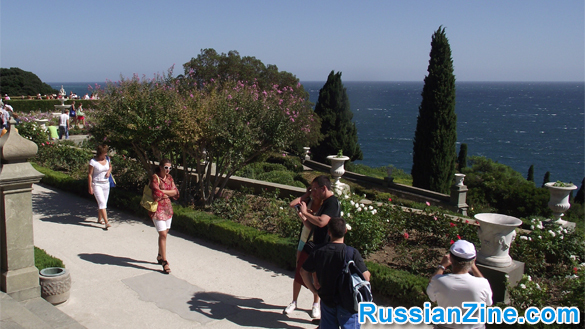 Nikita Botanical Gardens: Also located uphill from the sea, Yalta’s botanical gardens offer an amazing view of the Black Sea. For thriller seekers, a trip to the botanical gardens may not place high on a To-Do list, but trust me, it’s an amazing place. Spend a few hours there, soak in the beautiful flora, and then make your way back down to the boardwalk to resume partying. (Mountain) Ai-Petri: To get to Ai-Petri, you can ride a bus along a winding road (they leave every thirty minutes or so), or take the gondolla from the nearby town of Miskhor which will take you near the summit. Once up there, you’ll find plenty to do. There are cafes, guided hiking tours and horseback rides, caves to explore, or just hike around and take photos of the incredible views. Bars & Nightclubs: In Yalta, what’s hot one night might be stone cold the next. So, be prepared to look around and find where things are happening the night you’re there. Luckily, the main locations aren’t far from each other. In general, you’ll usually find a lively nightclub atmosphere in the Massandra beach area. The lounges and cafes you saw there during the day turn into nightclubs when the sun goes down. Definitely check out Off Bar in that area. 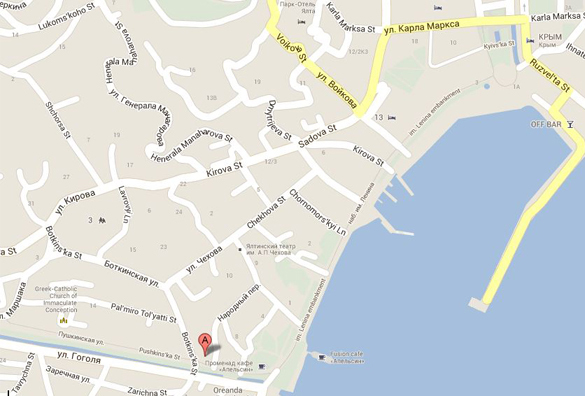 Meanwhile, the Oreanda Hotel (you’ll see it towards the far end of the boardwalk) has two primary nightclubs: ‘Matritsa’ and the creatively named ‘Nightclub.’ Also worthy of mention is Zolotoy Plyazh (Golden Beach) on Alupkinskoye Shosse 2. As with the Massandra clubs, in the daytime, it’s a beach cafe with lounge music and Italian fare. But at night, Zolotoy Plyazh becomes a hoppin’ dance club. 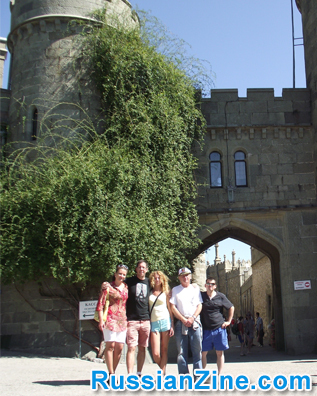 Perhaps this is cheating, but my recommendation for something off the beaten path in Yalta is….a trip to Sevastopol. 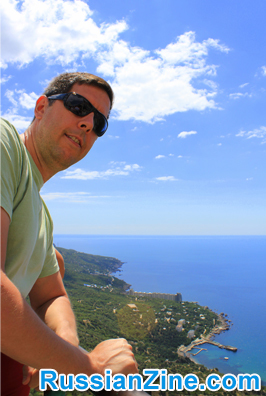 (You can see my article on Sevastopol here) I’ve known so many people who’ve visited Yalta – some for as long as two weeks – and never made the 90 minute trek to neighboring Sevastopol. The drive alone, along the cliff-lined coast is spectacular. Be sure to make a pit stop in Foros, about halfway out. (See my photo from the overlook there.) And Sevastopol itself is an incredible city. So much to do and see in the area. It’s worth at least a day or two if you’re in Crimea. Previous: Why Travel to St. Petersburg, Russia?